That's right! 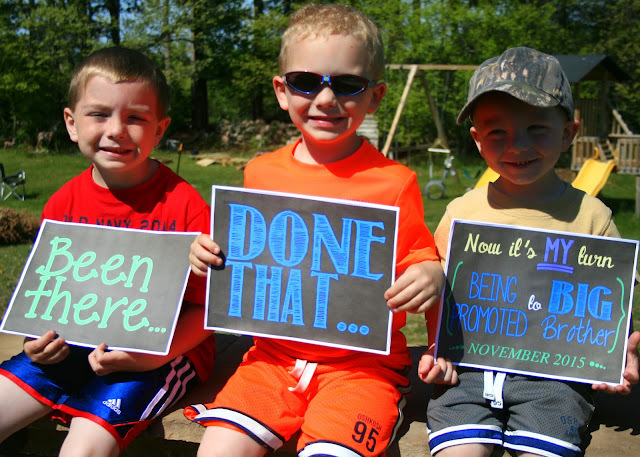 This fall our family is growing from 5 to 6 and we couldn't be more excited! I've been meaning to let you all in on this little secret we've been keeping but...well...I've been feeling MISERABLE since I hit the six week mark and making it though the day was all that has been on the agenda lately. I'll be 15 weeks this Friday and I *think* it is safe to say that the first trimester morning (all day) sickness if finally waning. Although I say that knowing full well that I threw up my entire lunch this afternoon (you're welcome for that tidbit, btw). Our official due date is Friday, November 20th and as soon as those words came out of the ultrasound techs mouth Collin looked at me and said: This baby better come early! That's right, Baby Kono 4 is due on the day before opening deer season, a/k/a the holiest day of the year in Wisconsin. While I will be seeing a perinatologist this time and it's possible he might be able to work some magic to keep this kiddo in longer, my guess is that Collin likely has nothing to worry about. In my head I'm pretty much expecting an October babe. More to come, including all the fun first trimester misery (yay! ), but for now I'm just so happy to let you all in our secret....we're having a baby!! Congratulations Kate and family! What wonderful news to read first thing in the morning! Ahhhh! I love how the picture turned out with the Big Brothers. :) So sweet! It's hard to believe you're already 15 weeks along! Time flies...well, for those of us without morning sickness, that is. ;) I'm so excited for the next adorable Baby Kono! Congratulations, Kono family! Love, LOVE the photo! Congratulations! So happy for you all! So so soooo happy for you!! !